When you are traveling to Morocco, one of the first things that you’ll notice is the incredible cuisine. 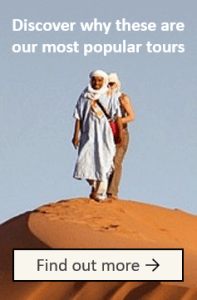 Before they come, almost every tourist visiting Morocco is told about at least 5 top foods that they must try. While we absolutely LOVE these “Top 5,” we also have 6 ideas of local food that we have discovered from years of living and eating in Morocco. 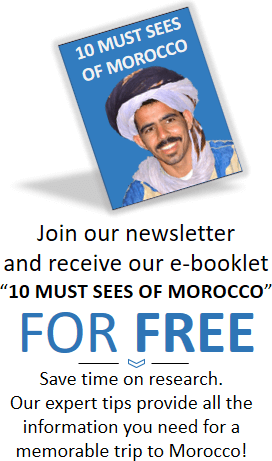 Read on to make sure that you don’t miss out on any of these on your tour to Morocco! The name for this food comes from the clay pot that it is cooked in. Usually served in one main dish and eaten with flat bread, tagines are a flavorful stew of vegetables, spices, and meat. Olives, preserved lemon rind, and French fries can all be added on top of a chicken tagine. You can also find this beef tagine receipe with dried fruits and almonds. The couscous grain is one that many Westerners are familiar with. 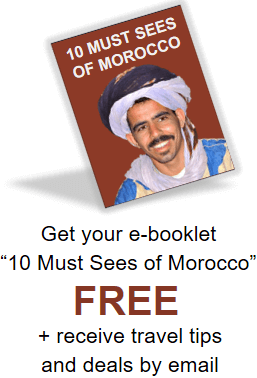 However, it is unlikely that you will have ever tasted couscous that compares with Moroccan couscous. In this dish is chicken buried under a pile of steamed vegetables surrounded by the yellow grain. Broth is served on the side for you to ladle onto the couscous at your own desire. This dish is one of the more flavorful, unique Moroccan foods. This sweet and savory thin pastry is stuffed with either chicken or pigeon meat, and is spiced with cinnamon. A dusting of powdered sugar covers the top, making this meal as beautiful as it is tasty. Known also as Moroccan soup, this tomato-based broth is common to both fancy restaurants and family dinners. This soup is filled with chickpeas, lentils, onions and other Moroccan spices. Choose harira for a simple, delicious meal, or an appetizer for a main meal. Who could come to Morocco without trying their famous mint tea? This tea is traditionally drunk after a meal. It is loaded with sugar and strong mint leaves. It’s a perfect ending to any Moroccan dish, or a road-side snack. While these dishes are amazing and definitely worth trying, after living in Morocco for 10 years, I have come up with a list of 6 foods that you don’t want to miss during your stay in Morocco. These dishes are less well-known, or not as common in tourist destinations. 1. Zaalouk: This eggplant dish is often served as a salad next to the main meal. It is made out of grilled or smoked eggplant and seasoned with Moroccan spices. It is perfect combined with fresh Moroccan bread, khobz. 2. Kabobs (Turkey or Kefta): These skewers of meat can be found at little roadside restaurants off the main streets of Morocco. Kefta is a sort of seasoned meatball. These meats are cooked to perfection and make a delicious sandwich. 3. Loubia (Moroccan white beans): This dish is our family’s favorite, often met with great excitement when it was bought for lunch. Moroccan white beans are cooked in a red tomato-based sauce, often with a little bit of a lemony flavor, and spiced to make a yummy, cheap lunch. 4. Malawi: Malawi is a little thicker than a tortilla, and is similar to naan bread, but greasier. We love eating it for breakfast or as a snack. 5. Orange Juice: A glass of fresh-squeezed orange juice is a perfect treat while you are walking around the streets of Morocco. It is cheap, easy to find, and a little bit addictive. Somehow this drink is the ideal combination of sweet and tart without the vendor adding any sugar. 6. Meatball Tagine: This tagine is a favorite, especially when we go to the Sahara desert. It consists of grated tomato cooked with spices and onions. It is filled with kefta meatballs. Sometimes eggs are cracked into it as well, making it even more delicious! Check out these blog posts if you are vegan or vegetarian…there are food options for you too! Want to taste these foods firsthand? 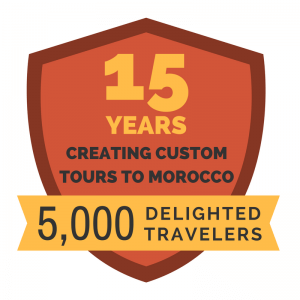 Please contact us about a private Morocco tour for your group. We can even arrange some wonderful cooking classes so that you can learn to prepare these foods and take them home with you.